Since its inception just after the repeal of Prohibition, the Los Angeles International Wine & Spirits Competition (now in its 70th year) has become one of the Top 5 wine competitions in the country. 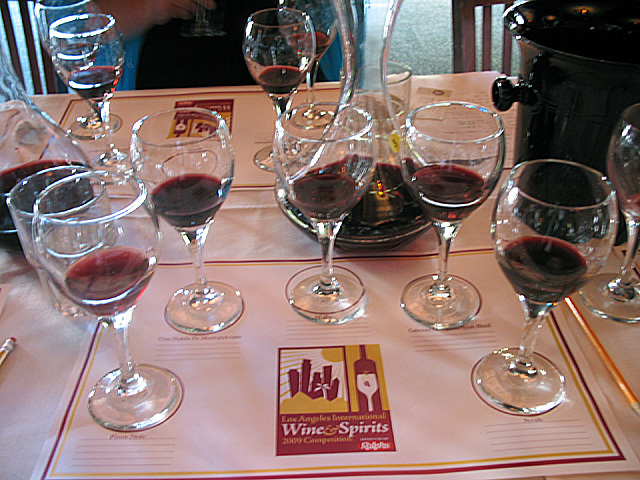 This year’s 3,400 wine entries were judged by an international panel for three days at the end of May, while another team of judges tasted 199 spirits in early June. The competition also serves as the foundation for a wine education program available to visitors of the annual L.A. County Fair, which opens Labor Day Weekend in September. I was invited to attend a very special sneak preview event to sample the competition winners, who didn’t find out they’d won until the awards were officially announced earlier today. Appropriately enough, the preview event took place at McCormick & Schmick’s on tony Rodeo Drive. In a change from previous years, judges awarded Best of Show red and white wines by price point. Last year, the Wine World of Sports category was created to introduce the wines of sports figures such as Mario Andretti and Greg Norman. Top honors this year went to Los Angeles Dodgers legend Tommy Lasorda’s wine, Pinot Grigio delle Venezie IGT, 2008. Not surprisingly, there’s a picture of Tommy on the bottle. I should also mention his wine was really good. New for 2009 is Music Uncorked, a category for musician vintners that includes everyone from Lil Jon to Barry Manilow. Maynard James Keenan, lead singer for Tool, and his Caduceus Cellars took Best of Show for Red Blends, Shinola, Merkin Vineyards, California, 2007. A blind taste test of the Best of Show reds. After making our way around the various tasting stations, attendees were invited to gather at a communal table, where glasses of the Best of Show reds were lined up. The object was to guess the price points of each glass. I have to admit it was both intimidating and educational to be seated at the table with two of the wine judges, Bob Blumer (aka “The Surreal Gourmet”) and Master Sommelier Michael Jordan. While suppressing my urge to eavesdrop on them, I managed to get two right (both of the $15 and under reds) and I wasn’t too far off with the other three. The Armida Syrah was the consensus winner at the table, even before the prices were revealed. 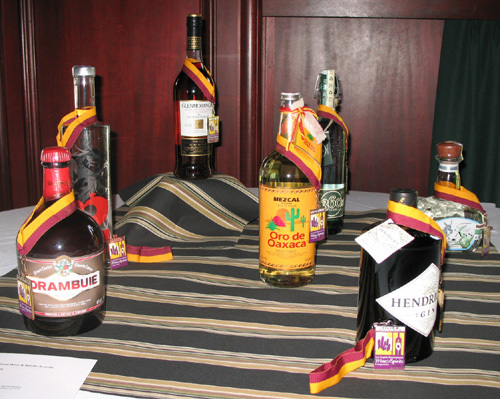 The Spirits display, including Best of Show winner Glenmorangie Quinta Ruban. The Spirits category was added in 2007, and this year Best of Show was awarded to The Glenmorangie Company, Glenmorangie Quinta Ruban (Whiskey/Whisky Single Malt Scotch 11-20 years old). The 2005 Samuel Adams Utopias, a Gold Medal winner. Winner of the Los Angeles International Commercial Beer Competition was The Bruery’s Berliner Weisse. 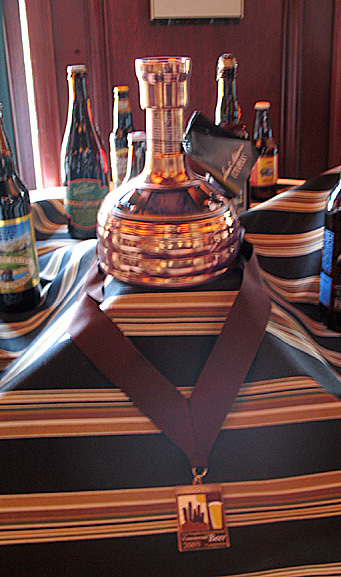 Among the other beers on display was the 2005 Samuel Adams Utopias (Gold Medal, Wood and Barrel-Aged Strong Beer). In the Extra Virgin Olive Oil competition (first introduced in 2000), California and Spain emerged as the big winners of the 477 entries. The public will have its first opportunity to taste the award-winners at Wine & Cars Under the Stars, a fundraising event to benefit the education programs of the Foundations at Fairplex. The complete list of all the winners is available at the official competition website.